It was windy and cold today, not the best weather to do stuccoing, but we need to move forward. 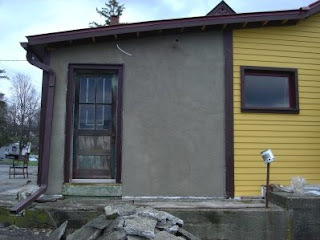 I applied the second coat on the north wall (no, Amy, this still isn't the final coat). This coat wasn't as easy to apply as the first one, and the surface turned what E! calls lumpy. Fortunately, this is the look that E! was hoping for. Great! I prefer luck over skill any day.